Optimum temperature measurement solutions offering ever-greater reliability and safety. 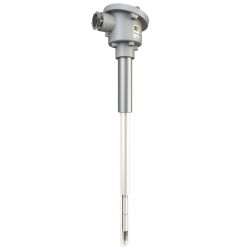 With more than 65 years' experience in the chemicals and petrochemicals sector, Pyrocontrole proposes a comprehensive set of temperature measurement assemblies developed specifically for these cutting-edge industries subject to severe constraints. Careful to maintain the design quality of its equipment and safety of your installations, Pyrocontrole's teams designed and produce measuring instruments for this sector in compliance with the regulatory stipulations, depending on the applications: European ATEX and Pressurized Equipment (PED) directives. Lower maintenance costs, reduced energy spending: Pyrocontrole's temperature sensors offer multiple advantages. Pyrocontrole proposes a comprehensive set of temperature measurement assemblies: process sensors with thermowells, multi-point sensors, bearing temperature sensors, high-pressure sensors, etc., compliant with the statutory ATEX and PED directives. Storage, transport, furnaces, reactors, refinery, flame measurement, pumps, motors, etc. and/or even shutdown of the process. enabling the sensitive part of the sensors to be changed without any risk for the ducts. Designed to measure temperatures at very high pressures of up to 5,000 bars. Placed inside reactors or furnaces for precise multi-temperature mapping. direct temperature measurement in storage pools or tanks. To prevent excessive temperatures in pumps and motors. We are organized to propose a range of products which comply with the regulations in terms of their design and production and throughout their life cycle: ATEX (explosive atmospheres, SIL (Safety Integrity Level) and PED (European Pressurized Equipment Directive). The SIL (Safety Integrity Level) requires certain essential information in order to define the preventive maintenance schedule so that the safety level can be maintained. Our temperature sensors can be equipped with a SIL-approved HART (Highway Adressable Remote Transmitter). With its automatic fault detection system, our transmitter complies with the EN 61508 standard on functional safety of electrical, electronic or programmable electronic (E/E/PE) systems. Pyrocontrole includes a declaration of conformity (PYRO EL2232) and an explanatory technical manual with this equipment. • ingress protection verification by a hydrostatic test or helium test certificate. Depending on the installation's level of risk, Pyrocontrole supplies Non-Destructive Testing (NDT) certificates. The wedlds can be carried out according to QMOS qualified welding methods and the expertise of Pyrocontrole's welders are certified QS (Food Safety) by the French national welding institute. Pyrocontrole also possesses its own COFRAC-accredited laboratory (no. 2-1385).